With all the excitement for the upcoming season and future of California’s Great America, it should come as no surprise that ACE NorCal’s annual preseason tour of the park had a record turnout on March 4. Nicholas Laschkewitsch, regional representative of ACE NorCal, said nearly 60 ACE members and their guests attended the two-hour tour, double the regular attendance of previous years. Led by CGA’s Roger Ross and Clayton Lawrence, the tour featured a presentation and question-and-answer session in the Great America Theater about the latest upgrades the park is receiving for the 2017 season, as well as a walking tour around the park to observe off-season happenings. The major new attraction this year is Patriot, a floorless conversion of the park’s 1991 B&M stand-up coaster Vortex. 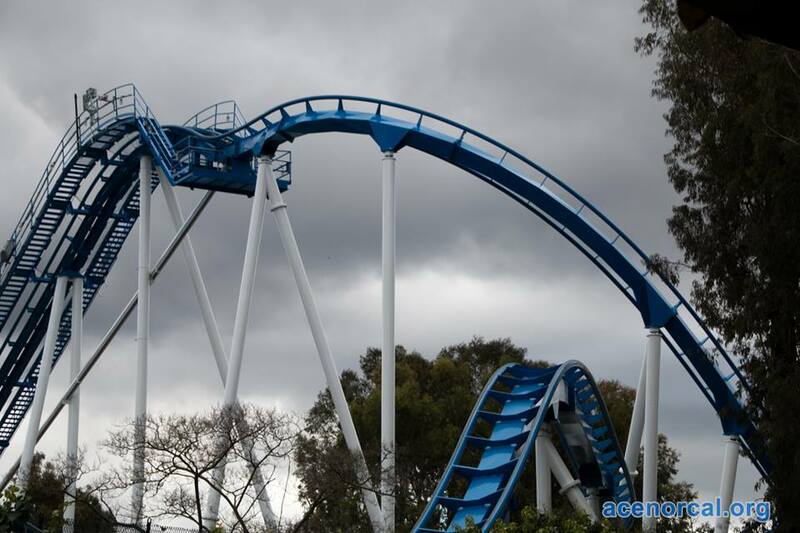 The ride’s former purple and yellow color scheme was replaced with a striking blue and white that stands out in Great America’s skyline. Park officials say the new floorless trains will give Patriot a smooth and comfortable ride. As part of the presentation in the Great America Theater, Laschkewitsch introduced longtime ACE member Brian Christensen as ACE NorCal’s new Assistant Regional Representative, and presented Erik Chalhoub with the 2016 ACE NorCal Richard Tuck Spirit Award. Amid the anticipation of Patriot is another major step forward for the future of Great America: the approval of the park’s 20-year master plan by the City of Santa Clara on Jan. 25. The plan includes a shopping district outside of the park known as Great America Marketplace, along with a rezoning that increases the park’s maximum ride height limit to 250 feet. As a result, the park could be seeing some large-scale projects happen in the near future, such as a hyper coaster and expanded waterpark. Ross said Great America’s owner Cedar Fair is heavily invested in the park, and CEO Matt Ouimet traveled to Santa Clara to give a presentation to the City Council during the master plan meeting. For 2017, Great America will also have a slew of new shows, food options and special events, including Red, White and Brews, a new festival slated for late May. WinterFest will return for its second year. Lawrence added that this year is the 10th anniversary of Halloween Haunt, and fans can expect some nostalgia. “The first year was memorable, but this year will be the most memorable,” he said. The 2017 season opens on March 25. For information, view the park’s new website at www.cagreatamerica.com. A huge thank you to everyone at California’s Great America who took time out of their incredibly busy schedule to give us the rundown of the park’s 2017 season and make this an extremely fun event that we all look forward to every year. Also, I’d like to say thank you to ACE NorCal for presenting me with the 2016 Richard Tuck Spirit Award. This is a tremendous honor, and was certainly unexpected! As a relatively new ACE member, I didn’t know Richard personally, but I hope my contributions amount to at least half of the good that he did for ACE NorCal. To view more photos from the event, visit www.facebook.com/pg/ACENorCal/photos/?tab=album&album_id=1427750633964621.